Macro Strategic Planning® - Macro Strategic Design, Inc. Consistently successful people do not live in ambiguity. They have clarity about what they want, when they want it and how they will achieve it. Consistently successful people imagine and write detailed plans with action steps, benchmarks and accountability. Such clarity of purpose and planning brings them into a more confident and powerful state of BEING. Such planning helps a person believe in the inevitability of their success. Less successful people either under plan or they do not plan at all. Unsuccessful people are immersed in ambiguity. They lack accountability for themselves and or others. Unsuccessful people struggle for clarity and have trouble maintaining the confidence that is essential to success. They have not learned how to imagine, create or implement a comprehensive, synergistic plan. Not knowing how to do what needs to be done is an extremely common roadblock. Not knowing what to do or how to do it is a leading cause of doubt, stress and fear. This stops many people from accomplishing essential planning and it prevents them from achieving their dreams. At Macro Strategic Design, Inc., we believe that every person is born with a success gene built right into their DNA. Our passion and mission is helping you find and activate that success gene. 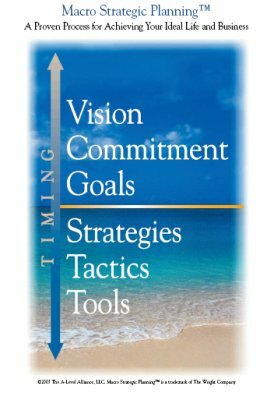 Macro Strategic Planning® is our unique trademarked process that can help you clarify what you really want NEXT, then imagine and create a detailed written action plan to overcome your biggest challenges and to turn even your boldest dreams into reality. What is Macro Strategic Planning®? Desired tangible, measureable results are more important than soothing egos, protecting the status quo, comforting peoples’ feelings or adherence to ineffective beliefs, behaviors, traditions and business models. It is this type of tough mindedness and integrity towards what is wanted next that produces consistent success. Flawed business models, unsuitable personnel and self limiting beliefs must be exchanged for what or who is the best fit for you moving forward. This illustration articulates the major aspects of a Macro Strategic Plan® essential for those who value clarity, attention to detail, accountability and measurable results. For decades, people were taught that the left hemisphere of the human brain is where logic, cognitive reasoning, mathematical, scientific and linear thought occurs and that the right hemisphere is where language, music, poetry, art and feelings occur. In that old overly simplistic construct, we were taught that people tended to be either left brain dominant or right brain dominant. We were taught that most planning and implementation was therefore flawed because it was absent crucial elements of awareness, perspective, details and consideration that occurred in the non-dominant hemisphere of the brain. Half brained plans were deemed to be more effective than no plan, but they were flawed because of inherently missing critical data and details. Rather than referring to this condition as “half brained” plans, we refer to it as fractional brain awareness, consideration and planning. Modern neuroscience has disproven the old left vs. right brain construct. Healthy human beings are in fact able to use their WHOLE BRAIN. But, unfortunately, most people prefer to use only the most common and comfortable parts of their brain! In our desire for intellectual and emotional comfort, we humans tend to ignore or “miss” important facts, realities and perspectives, especially those which conflict with what we want to believe. In summary, humans tend to be intellectually lazy and we want to be intellectually and emotionally comfortable. These factors combine to limit the accuracy of our perspective, our planning, our implementation and the effectiveness of our results. In essence, our natural and comfortable tendency is to choose fractional brain thinking and planning because it is easier, even when we aren’t getting the results we want. Many people believe that our experience on earth is only a temporary part of an overall spiritual journey. They perceive themselves (and everyone else) as eternal spiritual BEINGS experiencing a temporal journey where we come to learn a series of lessons which elevate consciousness, empathy, courage, faith, hope and love. So, we help clients who are spiritually oriented to infuse their spirituality into their vision, planning, behaviors and accountability. The result is a plan that synergizes WHOLE BRAIN thinking and details with spiritual insight and values. We define this as WHOLE BEING perspective, visualization, planning and accountability. Over the years many of our clients (even those who are atheists or agnostics) have found great value in looking beyond their own mortality when planning their lives, careers, businesses and finances. Every client that has engaged in our 100-500 year planning process has found insights and wisdom that far exceeds typical strategic planning, business planning, estate planning, life planning or financial planning. WHOLE BRAIN WHOLE BEING planning and implementation transcends all other forms of planning because it is uniquely and completely holistic and synergistic. When performed by MSDI, there are zero conflicts of interest, no backdoor hidden agendas and no financial or insurance products offered or sold. New and more desirable results require new thinking and behaviors. Oftentimes we must adopt very different and even uncomfortable ideas, business, financial, spiritual, political or cultural models if we are to elevate above our current condition. People who are sufficiently dedicated to what is wanted next will evolve in these areas until they are adequately aligned with what they want. They move themselves into alignment with what they want and as they do so, they begin attracting what they want. This is what we call aligning with success. A holistic WHOLE BRAIN WHOLE BEING plan makes the journey towards success faster, easier and less expensive. This is due in part to fewer mistakes occurring and less fear or suffering experienced along the way. People struggling to succeed are suffering because they have yet to sufficiently align themselves in relevant ways with what they want. Many of those who are struggling and suffering tend to perceive themselves as victims. It may seem to them as if God, the universe or everyone is against them. They tend to take it very personally, even when God, the universe and lots of people are actually “on their side”. As people improve their awareness, behavior and operating model, they move themselves into closer alignment with what they want next. And what they want next becomes more attracted to them. Thus the Law of Attraction is activated and energized by the Law of Alignment. We invite you, your family, colleagues, employees and friends to experience this truly unique method of planning. Learning how to apply your WHOLE BRAIN and WHOLE BEING as you plan your future will enlighten your awareness and reveal possibilities previously unimaginable. Click here to learn about our Personal Planning Process.